With SanDisk Ultra® UHS-I cards you’ll benefit from faster downloads, high capacity, and better performance to capture and store 16GB to 64GB1 of high quality pictures and Full HD video4. Take advantage of ultra-fast read speeds of up to 48MB/s* to save time moving photos and videos from the card to your computer. 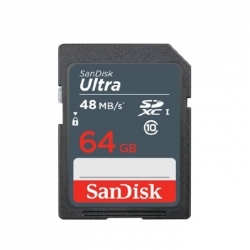 SanDisk Ultra® UHS-I cards6 are water-proof, temperature proof, X-ray proof, shock proof, compatible with SDHC™ and SDXC™ digital devices.